Almost anyone who knew Keith Gilbertson could speak of his prowess as a football and basketball coach. But few might know that he was probably even better as a track and cross country coach. Gilby started coaching track when he was still in college, mentoring a Pullman High team that in the spring of 1950 qualified six athletes for the state meet. 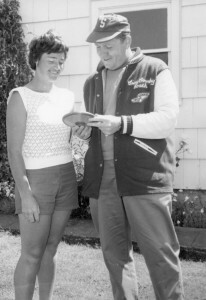 After returning to Snohomish that fall, he became the assistant track coach under Everett Woodward and succeeded Woodward as the head coach in 1955. At that time, cross country was not even a letter sport at Snohomish, but Gilbertson embraced it as part of a year-round training program and developed runners that by 1965 were in the state, national and world record books. Gilbertson’s cross country teams won seven consecutive league titles and went unbeaten in dual meets (72 straight) from mid-1958 through 1965. His 1959 team won the AAU state and Inland Empire crowns, and subsequent teams won the Washington High School State Invitational in 1960 and 1965, garnering the first state team titles in school history. From the start of the University of Washington-sponsored state invitational in 1959, Gilby’s teams finished fifth, first, fourth, second, second, second and first. The runners became so dedicated that, in Gilby’s final two seasons as head cross country coach, he was able to simply assign daily workouts and spend his own weekday afternoons helping to coach the football team. SHS runner Ron Stjern was named a prep All-American in cross county, and in 1965 he briefly held the world 6-mile record for 16-year-olds. 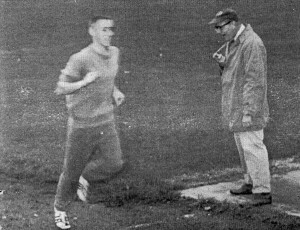 By 1966, Gilbertson-coached SHS runners held four of the top 10 times all-time on the national high school 6-mile list: Stjern second, Walt Hoerath fifth, Mike Evans ninth and Lyman Pease tenth. Stjern also ranked 10th all-time in the 2-mile, third all-time in the 3-mile and 10th all-time in the 5,000 meters. Gilby coached two SHS state champions in track: shot putter John (Pressley) Robinson in 1954 and state half-mile record setter Tom Gilpin in 1961. His best track team in 1965 produced nine state-meet qualifiers. Besides coaching SHS athletes, Gilbertson also operated a largely self-funded summer AAU track program from 1958-65 that was open to anyone with a desire to compete and improve. Although the Everett Elks gave Gilby modest financial support for the Elks Track Club, most of the money for travel and equipment – easily thousands of dollars over the years – came from his own pocket. When Gilby took area athletes to out-of-state competitions, he packed them into his car, paid for the gas, picked up the meal tabs and paid for their motels. And when accommodations were tight, he slept on the floor so his athletes could use the beds. Elks Track Club athletes qualifying for nationals made trips to Bakersfield, Calif. (1958, 1960 and 1965), Boulder, Colo. (1959), the U.S. Olympic Trials in Palo Alto, Calif. (1960), New York City (1961), Walnut, Calif. (1962), St. Louis, Mo. (1963) and Corvallis, Ore. (1964). Gilby literally burned up at least one car, criss-crossing the county with his athletes, as an engine fire broke out in the driveway of Mount Vernon pole vaulter Jack Cramer (second at 1962 nationals) upon their return, sending the coach’s unoccupied car up in flames. Gender lines were not a barrier. Helen Thayer, a discus thrower from New Zealand who would later gain notoriety as a world adventurer, lived with the Gilbertsons for one summer while being trained by Gilby for the 1961 British Commonwealth Games. Other outstanding AAU athletes coached by Gilbertson included marathoner Jim Freeman, miler Jack Larson, pole vaulter Brian Sternberg (world record setter as a UW sophomore in 1963), race-walker Alan Cross, hurdler Bill James, javelin thrower Ralph Sager, sprinters Jim Kjolso and Rick Harder and weight thrower Mike Bianco (No. 3 in the world in the shot put at BYU in 1966). Besides coaching year-around, Gilbertson served as a national high school representative and committee worker for the NCAA Track and Field Committee and for the U.S. Track and Field Coaches Association. He was named the Everett Herald’s Coach of the Year in 1963, and in 1966 he received the Washington Track and Field Federation Award for outstanding contributions. Thirty years after coaching his last race, he was among the first inducted into the Washington State Coaches Association Cross Country Hall of Fame in 1994. Photos of Coach Gilbertson’s two state-champion cross country teams, click here.